Sorry for the complete silence recently. We have a family member that is really poorly. That has taken priority as well as a lot of emotional energy. Hopefully the emotional rollercoaster has stabilised a bit. This run came close on the heels of the previous 2 but was no less enjoyable. It was also in a part of the county/diocese that I had very little knowledge of as it is not somewhere that I go very often. Unfortunately I did not have any volunteers to run with me this week but instead I had some very detailed directions as to the route I should take. I set off having had the obligatory photographs. I am constantly amazed that people turn up at 9ish on a Saturday morning to wave me off. As I had done three of these runs this week it meant that I had missed out on some of the other training runs that I do in order to fit them in. For some odd reason I decided that instead of just completing the distance today I would include intervals within it. I did 1 mile warm up and then started to run 0.25 of a mile at a faster pace followed by a recovery of the same distance. I figured that I would probably end up walking the recovery section but in reality I was surprised by how good I felt. I managed to run them all, and at a pace that I was pleased with. I didn’t stay long which always feels a bit rude seeing how these people have made the effort to come out and see me but if I hung around I would get too stiff. A bit further on and I completed my last interval (narrowly missing out on being tripped over by a dog!) and then I entered March. When I don’t know a place and I arrive I think that the run is nearly over and today, of all days I was ready to stop. Unfortunately it was one of the occasions when I had quite a lot further to go. I passed a church near the edge but this wasn’t where I was headed. I had about another mile to go. This is really cruel as my brain had thought I was finished, only to have to carry on. Pure torture. I was in fact, headed right in the middle of the market town. As always it was worth getting there. I was presented with a medal which always has to be worth it! I think this medal was almost more appreciated than the one I will get once I complete the marathon as it was so unexpected! There was also a coffee morning (tea is always very welcome) and we sat around and had a really lovely chat (well I mostly chatted and everyone listened but there was some discussion!). All in all another lovely run. I ran in a new place, met some amazing people, surprised myself with how well I managed to complete my intervals and got more miles under my belt. This entry was posted in Running and tagged intervals, marathon training, Mothers' Union, running on March 12, 2017 by knitnrun4sanity. In my last post I talked about how I am trying to keep my long runs interesting. Luckily, for the majority of my long runs coming up I will not have to worry about boredom as I am running around the diocese, visiting as many branches of the Mothers’ Union as I can. (I am running the marathon for the Mothers’ Union – this is of the posts that is coming up – explaining just who they are and why I am doing it for them.). In the meantime, if you live near Yaxley in Cambridgeshire this coming Saturday morning, keep a look out for me – I will be running between Yaxley and Woodstone, then Woodstone to Farcet. If you do live in these areas (or know someone that does) and would like more details then please e-mail me on running4familiesworldwide@gmail.com. I will be glad of any company. This entry was posted in Running and tagged Cambridgeshire, routes., running on February 7, 2017 by knitnrun4sanity. I feel that I am a day late writing this post. Over the last 2 days I have enjoyed reading everyone’s round-up of the year and have been inspired to write my own….even if I am a day late. According to Garmin I have covered a total of 1,539,27 miles running, swimming or biking. This has been completed in 324 activities and over 238 hours. It seems that most of these are running as I have done 212 running activities, covering 1,42:02 miles in 191:36 hours. 5k This kept coming down and now stands at 25.31. Can I go below 25 minutes I wonder? Half Marathon: I was so pleased to get 2:00:49 at the Silverstone Half Marathon this year. If only I had gone 49 seconds faster. Marathon: 4:30:31 at London although my official stat was 4:40 but over a distance of 27 miles!! Which time do I take? The one from my watch that recorded the marathon distance or the official race time? I don’t do New Year Resolutions but I do have 2 targets: 1 to raise £2000 for my charity and to run London in less than 4.30. I am guessing that by this I mean my official time! If you want to get fit in 2017 you can join this supportive Facebook group to help you start running or simply to get fitter by improving your walking. This entry was posted in Running and tagged PB's, races, running, Summary on January 1, 2017 by knitnrun4sanity. 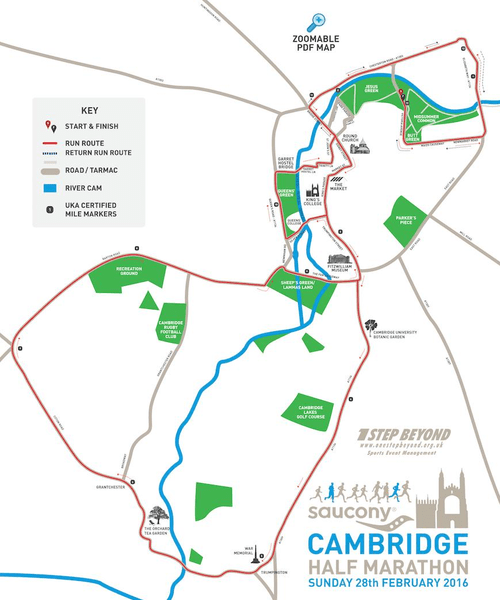 I have run every Cambridge half Marathon event since it started in 2011. Today was the first time I actually enjoyed it. Previously there has always been something that has not gone my way – from falling over to being ill. Not so this year. I set out with the idea that this was another training with the added bonus of a medal at the end. I was under no pressure to get a time, I was just going to get round. This year, as with nearly every other, they had changed the route but this was a big change: 1 loop instead of 2. On paper I was dreading this as I thought it would feel a long way out to Granchester as it is a long way from the centre of the city and the crowds. In reality it was lovely. The miles ticked by nicely and there was good support along much of the route which makes a huge difference. The sun came out, I met some lovely people along the way and had a good chat. There were a couple of bands along the way (the drummers along Elizabeth Way Bridge was awesome). Look at the size of the medal! As it had been cold, I hadn’t realised just how cold my body had got and as I started off I really couldn’t feel my feet and my fingers got pins and needles as the warmth returned. The trouble with not feeling my feet was that my running style changed as I was slapping my feet down on the ground. This meant I had real pain along my left shin. To begin with I was worried that I would have to drop out or run the risk of getting shin splints which could jeopardise my marathon. Luckily after 2 miles the pain went and I could run properly again. I did stop to loosen my laces a bit later as it felt like the blood off from my toes and I worried I might lose one of them. This really helped and I had no more issues for the rest of the race. My mile times say it all: The first was 10.05 followed by 5 consistent miles of 9.47, 9,.45, 9.44, 9.50, 9.44. There was then a mile of 10.01. I think this was the mile where I stopped to loosen my shoelace. Mile 8 was 9.56 followed by 9.53, 9.20, 9.30, 9.29 and then 8.37!!! I could obviously smell the finish line. There was a moment when I wondered if I was being a bit silly but I dismissed these thoughts. I had something to prove to myself! I am so very, very happy with myself. It has been a real revelation that you can run that sort of distance and not die half way around. I thought that was just my lot. I can honestly say that I enjoyed every minute of it and not just the end. I have high hopes for the marathon now. Because I am the mouthy sort of person that I am when I saw someone really struggling I tried to say something positive to them to try to encourage them. I knew exactly what they were going through and can remember how much everyone’s kind words to me meant. It is my way of giving back a little to the running community. This entry was posted in Running races and tagged Cambridge half marathon, race, running on February 29, 2016 by knitnrun4sanity. Purely coincidently I also received another running gift through the post yesterday. I first heard about these some time last year and was very tempted to sign up straight away but waited. Last month I took advantage of an offer and took the plunge. When you subscribe to Joggbox you get a box every other month through the post filled with running goodies. This is what I got this month. Touchscreen gloves will be very useful when wanting to us all my tech when running. A soothing gel by Meltonic which I am looking forward to trying out on my sore muscles. The leaflet that comes with it details how much each item is worth which I feel a bit mixed about. I understand why it is included so you can see how much value you get each month but I think that I would prefer to just receive the items. Maybe I am just too trusting? I really liked receiving this. I looked forward it. I like surprises. and the opportunity that it gives me to try new things that I wouldn’t necessarily try otherwise. All the items that I received are useful and will get used which, if I am honest is a bonus. I shall now have to decide if I wish to carry on ……..
Have you ever subscribed to something like this? All views on this are entirely my own. This entry was posted in Running and tagged Gifts, running, Subscription box on February 20, 2016 by knitnrun4sanity. Today was cross country day. One of the first things that I do when I wake up knowing I have a run to do is look outside. Today there was no obvious frost or snow which I took to be a good sign. My biggest concern this morning was what to wear? I started off putting on 2 pairs of legging but then decided that they might be too much so took one pair off. On the top I had my new thermal skin top (bought in the sale) with my club vest on top. It wasn’t that far for us to travel to but far enough for there to be some snow on the ground. It was held in a gorgeous ‘undulating’ park. It was a beautiful day for a run. This is looking towards the start – that hill was right at the start! There were a lot of people running and boy was it tough. I was desperate not to end up too far at the back and therefore probably set off a tad too fast. It was my first proper cross country though with logs to jump over, short, sharp ups and downs, slippery icy bits, thick oozy muddy bits. There was even one bit where I thought that I would end up in a lake each time we past it as it was muddy and sloping towards the water. The route was supposed to be about 4.9 miles but my watch made it nearly 5 and a half although it didn’t really seem to pick up the GPS properly as uploading it just now I see that there is no information about the changes in elevation which I am truly gutted about. My heart rate was pretty high throughout so it was pretty tough going. I shall have to look at my sons as he did one lap of the route so will give me some idea from his watch. My activity tracker said that I went up the equivalent of 33 floors if that can be trusted all? This week I took the plunge and bought some second hand trail shoes. They arrived yesterday and against the little voice in my head that suggested that it was not a good idea to try them out for the first time in a race, I wore them today. They were fab. They kept my feet dry and did quite well considering the terrain that they had to deal with. It was definitely not a PB course but Iwould go so far as to say I loved them. A great investment. This entry was posted in Uncategorized and tagged Cross Country, running, snow, Trail shoes on January 17, 2016 by knitnrun4sanity. After all my exertion of Thursday in the snow, rain and cold. I was determined to keep warm yesterday so studiously ignored my son with his pleading to bike to school. It was icy anyway – far too dangerous. As it turned out the afternoon was gloriously sunny and I would have loved to bike home but the morning was not very enticing. I had thought that yesterday would be a rest day but in actual fact, I had an hour and thought that I could fit in another easy 5, effectively splitting a long run over 2 days or, to put it another way, getting the mileage in. It was very cold and I again put on 2 pairs of leggings, a short sleeve top, a long sleeved top, jacket, high-viz vest and gloves. The only thing I did differently was wear a hat as I read some advice about preventing hypothermia whilst running in this cold weather. It seems a hat is important, as are gloves. The other thing is to try and stay dry – jump over puddles and wear waterproof clothes. If it is very cold head to forests etc where it is sheltered. The other things are to layer up and to run into the head wind on your way out (if there is one). Dressed up like Michelin man I was warm enough and enjoyed a 6 mile run. I promise you, easier than it looks. I dread new exercises as my brain takes a while to process the new info and I usually look like a real fool! Luckily, I didn’t have that many problems with this one. YAY! I did 4 sets of 4 each arm, and on the last set even moved up a weight to 15 kgs). We then moved onto single leg squats (I do this one without a weight, 3 sets of 6 on each leg). My PT said today that with this exercise he has nothing to say anymore. How good does that feel? I then do a set of three exercises, arabesques, press ups (3 sets of 8), and seated rows (3 sets of 12) The final set of exercises were based on the core: roll outs, Russian twists and dead bugs. Enough for anyone! I am really pleased with how strong I am getting. I am not noticing visible differences in my body but with these exercises I am definitely Way, Way, Way stronger than this time last year. That is a really good feeling whether it helps my running or not. This entry was posted in Running, Uncategorized and tagged gym work, Hypothermia prevention, running, Stength training on January 16, 2016 by knitnrun4sanity.